Empower your IT department's teams to collaborate and organize their incident tickets. This two-way integration requires you to download our Freshservice Power-Up in your Trello boards to be able to view Freshservice tickets directly from linked Trello cards and more. Empower your IT team to solve your company's needs faster. 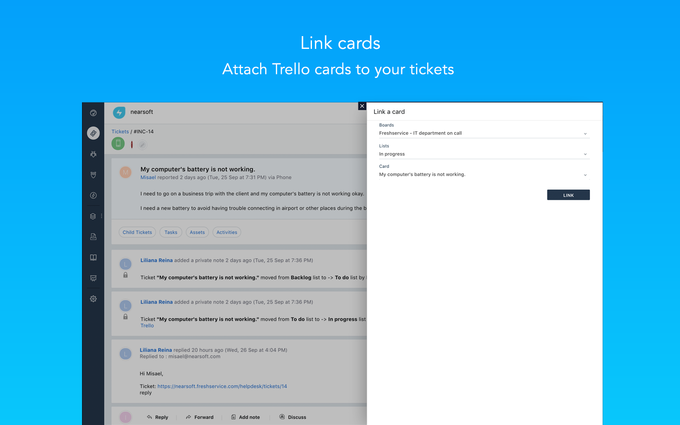 Improve your IT service team's performance by empowering them to send their tickets to Trello cards. 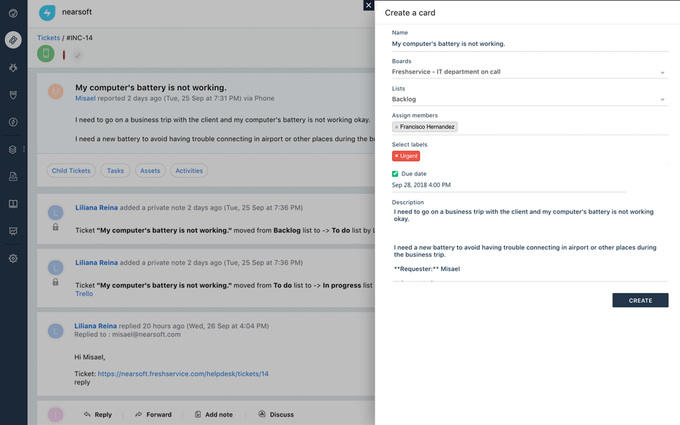 Organize your workflow in Trello or boost collaboration with other teams, taking into account tickets' priority to deliver exceptional support according to the company's needs. 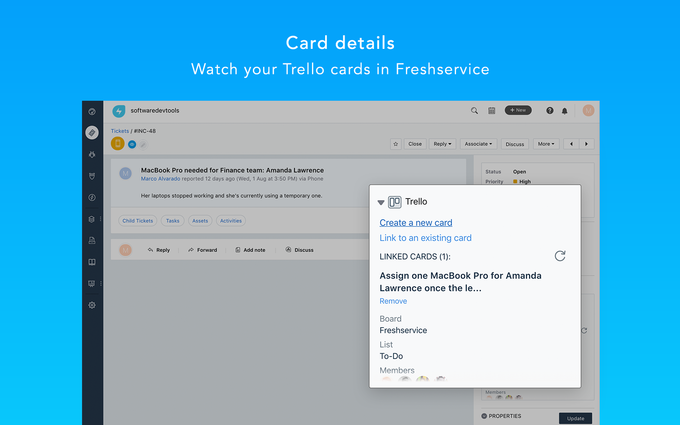 Your service desk team will collaborate instantly and effortlessly by linking Trello cards + Freshservice tickets. 1. Link an existing Trello card to a Freshservice incident ticket. 2. Create a new Trello card directly from a Freshservice incident ticket, indicating description of what's needed, requesters name, the status and priority for the Trello teams to be in sync. 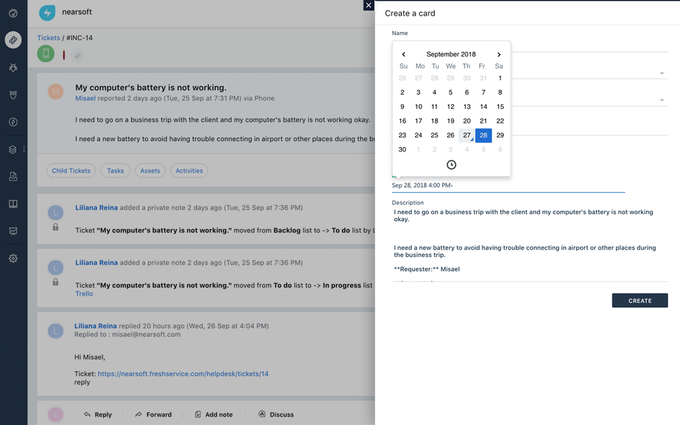 Be able to select labels, assign members and setup a due date for your new Trello card. 3. Keep your IT support team and other Trello teams in sync. Track the progress of a Trello card linked to Freshservice incident tickets right from the ticket's page. 4. 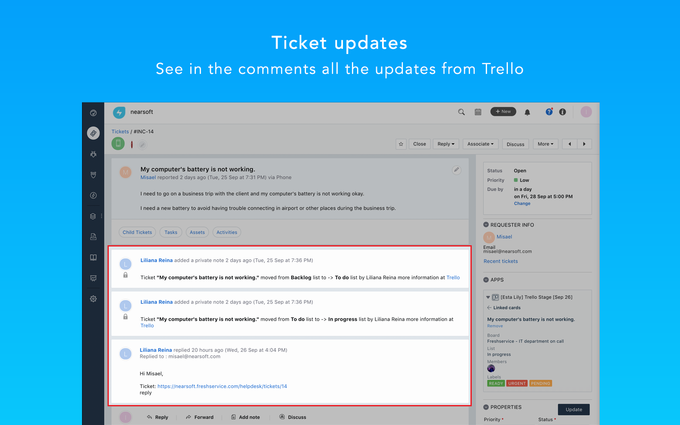 Receive updates on Freshservice incident tickets when the Trello cards linked are moved from list, so agents stay updated on their status. 2. Upon clicking, it will send you to a webpage to "Allow" Freshservice to access your Trello account. Please note that this will be the Trello admin user and the app will retrieve all Trello boards from this account. 3. Upon allowing Freshservice to access Trello, the app will be properly installed and will send you back to your Freshservice instance. You'll need that agent's API key to setup the Freshservice Power-Up in Trello.